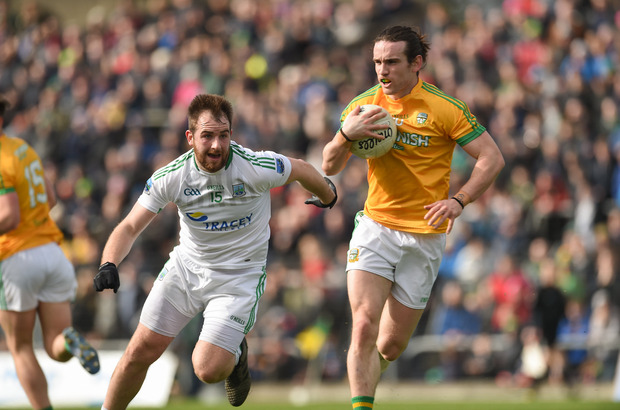 Meath booked a return to the top flight and a league final date with Donegal in Croke Park with a deserved win over Fermanagh in Navan’s Pairc Tailteann. The Royals entered this game in an unusual position. They knew a draw or a win would guarantee passage back to the top flight but even a defeat here might have seen them through given their healthy score difference. However they took care of business themselves and ran out comprehensive winners to set up another meeting with Donegal, the only side to beat them in this league campaign. Playing with the aid of a significant breeze, Fermanagh hared out of the traps and kicked the first four points of the game inside four minutes. However, a combination of improvement from Meath and Fermanagh’s wastefulness meant they wouldn’t score again for 30 minutes. Meath opened their account through Cillian O’Sullivan on 16 minutes and they’d grab another 1-2 without reply. Barry Dardis got the goal, his third of the campaign, after good work from James McEntee and Bryan Menton to give the home side the lead for the first time. Fermanagh brought their wides tally to 11 for the opening 35 minutes but Ciaran Corrigan brought the half to a close with his second point to see the Royals go in leading 1-4 to 0-6 at the break. Fermanagh scored the first point of the second half to tie things up but Meath, with the wind at their back, responded with a quick-fire 1-4, James McEntee grabbing the goal after brilliant play by Bryan McMahon to prise open the Fermanagh defence. That goal put Andy McEntee’s side seven points clear and knocked the fight out of Fermanagh and from there the Royals coasted home to ensure a first return to the top flight since 2006. SCORERS - Meath: C O’Sulivan 0-4 (1f), B Dardis, J McEntee 1-1 each, M Newman 0-3 (1f), B Menton, B Brennan (1), J Conlon 0-1 each. Fermanagh: R Jones 0-3, C Jones, S Quigley (1f), C Corrigan 0-2 each, U Klem, D McGurn (1f) 0-1 each.